Teeth whitening is one of the easiest, most cost-effective ways you can improve your smile. The technology of tooth-whitening has come a long way, and tooth bleaching with state-of-the-art products can improve the whiteness of your smile dramatically in a very short time. Can Teeth Whitening Improve MY Smile? 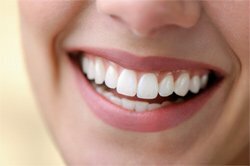 Many of our cosmetic dentistry patients in Salt Lake City are good potential candidates for tooth whitening. Some have uneven color or marks on their teeth, others have had their teeth simply yellow over time, and still others have stains from wine, soft drinks, coffee, or smoking. If any of these sound like you, then you could be an excellent candidate for tooth whitening. Be sure to mention any dental crowns, porcelain veneers or dental implants you have before whitening, as they may respond differently than your natural teeth to the tooth bleaching gel. Tooth bleaching is fast, painless, and safe. Although it can cause some sensitivity, we’re happy to talk about how you can make sure that it is a very pleasant experience at our Murray, UT office. Dr. Blackwood will be able to assess your individual case, and recommend if tooth whitening may be right for you. Salt Lake Dental Care also offers Zoom whitening, one of the most innovative technologies in whitening today. The whitening process is very simple and can be completely it just one visit. The Zoom whitening gel is gently applied to your teeth and then exposed to a specially designed light that activates the gel. The gel and the light work together to break down stains. The procedure is completely painless and will give you immediate, and dramatic results. Zoom whitening is one of the very safest and fastest ways to whiten your teeth and will certainly leave you with the sparkling white smile you’ve always wanted. Contact our cosmetic and general dentistry practice in Murray, UT by calling or using the form on the right–we’d love to talk to you about how Zoom whitening can create a brighter, whiter, smile for a happier, more confident life today if you are in the Salt Lake City area, from Draper to Sandy, Utah!